Your business already invests in Google AdWords. The LiveEngage SMS integration with Google AdWords enables your brand to make the most out of this expense with Google AdWords Click-to-Message. This integration lets brands tap into consumers who prefer to use SMS as a form of communication. Google AdWords Click-to-Message enables consumers to message a brand via SMS, directly from a mobile pay-per-click ad. LiveEngage ensures that Google AdWords Click-to-Message interactions are routed to the right people at the right time, integrating them into your broader marketing programs and contact center operations. For brands, creating a presence on the channels used by their consumers is key to building connections and creating prospects. For brands that want to enable Google AdWords Click-to-message with LiveEngage, they must first onboard to Twilio to receive a number. For full onboarding instructions please contact your LivePerson representative. 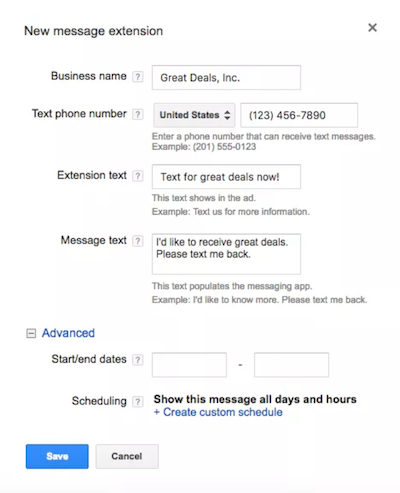 Click on Campaigns and select the campaign or ad group you’d like to use message extensions with. Then select the Ad extensions tab and locate Message extensions in the View drop down list. Click the red + Extension button. After doing so, scroll down on the next screen to find the + New message extension option. Business Name (25 Characters): Provide a business name people are familiar with. Text Phone Number: This is the number that people will be sending SMS messages to. The only requirement here is that this number can receive SMS text messages. Please speak with your LivePerson representative for onboarding. Extension Text (35 Characters): This is the text that will appear on the search engine results page alongside your ad. Use language like "Text us" or “Message us” within this extension text so that it’s clear to searchers that by clicking here, they should expect to send you a text. Please note: certain Android devices do not support this feature. In these cases, the number will be populated but there will be no default text. Schedule your extensions: If your brand isn’t available to answer SMS messages outside of business hours or on the weekend, be sure to schedule your extensions to only show during hours your team is ready to respond to consumer’s messages. See options for adjusting the extension with your own custom scheduling. Click Save, and the extension is ready. When you integrate Google AdWords Click-to-Message, your consumers’ SMS conversations will be routed and managed all within LiveEngage. Real time KPI tracking, plus performance and operational reporting ensures that you will know exactly when and where you can optimize your operations. Contact your LivePerson representative today to begin connecting to your consumers from Google AdWords.